Rock Photo holders are so fun to make! They are so easy, and they make great gifts. 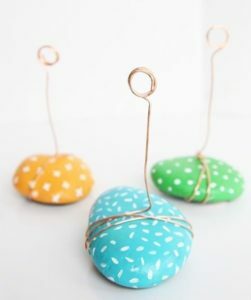 You can decorate your entire house with these little boogers! At CVYR, we have had kids use air dry clay instead of a rock, and those come out super cool as well. 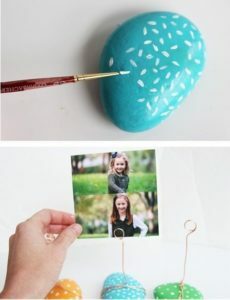 You can form the clay into several different shapes – just make sure you use enough to make it heavy enough to hold up a picture, and make sure it has a bottom of some sort, so the picture doesn’t fall over. 3) Grab your wire, bend around rock, come up in the center, then wrap the wire around a large pen/pencil to create the short spiral. Add beads before the spiral if you want!